Just when you thought things couldn't get any worse (or low) for Steve-O and his amazing troupe of imbeciles, they return once again to show the world what alcohol and drugs do to totally stupid people. Apparently since the last time we saw Steve-O, the L.A. fugitive division of the Los Angeles police arrested Steve-O for a number of crimes but fortunately for our loveable idiot, his producers decided to put up the bail money for him. This DVD (like the last one) features Steve-O and crew traveling around America and Europe performing their famous "Don't Try This at Home" road show to screaming crowds who love seeing people do stupid things to each other. Some of the outrageous moments on this DVD features Ryan Dunn putting Steve-O in a sleeper hold in almost every European town that they visit and various skating moments. This DVD also encourages drug use as a "cool" and "hip" thing because when in Amsterdam, Steve-O decides to swallow a condom filled with marijuana so that they can all smoke in Switzerland. Unfortunately for Steve-O, his play goes amiss as he desperately tries to purge this object from his body and those that are easily offend by human excrements, should not watch this DVD. Fortunately, at a live show, Steve-O vomits the condom out and to the cheers of his crew, they enjoy a smoke later on. Another disturbing aspect of this DVD is that Steve-O gets into a fight with a person from the crowd over the vomited condom and let's just say, the person leaves with a bloodied face. The DVD also features a variety of woman flashing their breasts, the Steve-O crew getting kicked in the crown jewels, more swallowing of condoms filled with marijuana and Steve-O being arrested in Sweden. Nick Dunlap (the show's resident producer/director and loser) also decides to trash a public bar in Finland, urinate inside a hotel and just show the world how great Americans really are. Fortunately... Dunlap was arrested for his behavior but unfortunately... Bam Magera captured the footage too late. 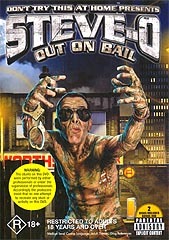 As Steve-O's "Don't Try This at Home" tour goes on and on, the video quality of this DVD also improves and is presented in the standard 4:3.1 format. The audio quality of the disc is quite clear and audible and features Dolby Digital. This DVD comes with a plethora of DVD extras that includes "Hotel Trashing 1, 2, 3 & 4", Deleted Scenes, the Making of Video and Ryan Simonetti that accompany the main feature quite well... provided you enjoy this entertainment. The DVD also features a bonus disc entitled "PCP Saved My" life and is a short pseudo-documentary on what happened when Steve-O smoked PCP that ends with a short poem about his life and the last time he cried. This DVD stoops to some extremely low moments for Steve-O and Preston Lacey that once again prove just how stupid they really are.